A high power RF driver module is available in output powers of 50W, 75W or 100W. Powered from 220VAC or 110VAC, the modulation inputs allow either full digital control or activation of an internal pulse generator. First pulse suppression is automatically implemented. l Easier and more accurate panel controlled laser delay. A compact high power RF driver module is available in output powers of 50 or 100W. Powered from 28VDC, the modulation inputs allow either full digital control or activation of an internal pulse generator. First pulse suppression is implemented through either analogue modulation, RF off analogue control, triggered first pulse suppression, or triggered pre-pulse kill, as described in our FPS guidance notes. On board LED’s and TTL logic outputs monitor driver status and cooling is through forced air over the heat sink. 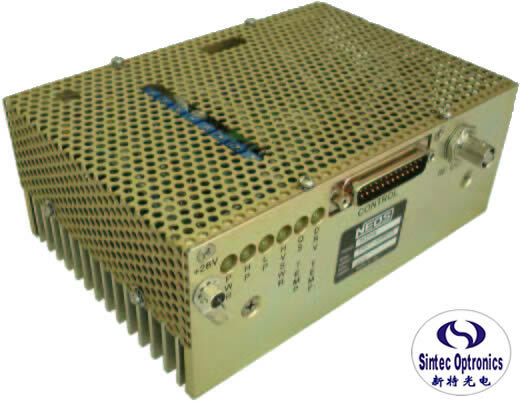 The R390XX-YYDMZZZ-SC is a low to medium power radio frequency generator in a compact, OEM package. The driver supplies an RF signal to an acousto-optic Q-Switch, typically in an Nd:YAG laser. The Q-Switch, when excited, deflects a large portion of the laser light off the optical axis of the laser cavity spoiling the gain in the cavity and allowing the energy to be stored in the upper state of the gain media. When the RF is turned off, typically in 50ns, the Q-Switch becomes transparent and a light pulse is output from the laser. The RF driver has two digital modulation inputs: Fixed and Variable. These controls allow the customer to issue a pulse command of a "Fixed" pulse width, the duration determined by the driver pulse width control, settable by the customer, or issue a "Variable" pulse command, the duration determined by the input signal pulse width. The RF driver may be modulated in "Fixed" duration mode at any frequency from 1 Hz to 500 kHz by an external frequency source. In "Variable" duration mode, the RF driver can be modulated from DC to 500 kHz. The RF energy can be modulated off in a short period of time (50 ns typical). The RF Driver can produce up to 24 watts output into a 50 ohm load. The R390XX-YYDSZZZ-SC driver is factory configured for RF Frequency, Power, and Control Options when ordered. The R in the model number indicates that this product is compliant with the EU Directive 2002/95/EC for Reduction of Hazardous Substance. Adjustable but limited to no more than 10 % above rating. The option available for the driver is factory set, and is specified by the last three letters of the model number. When the FPS or PPK control option is selected, the circuit is designed to eliminate the large light pulse that is output from the laser after a long period of inactivity. Normally, the first pulse from a Q-Switched laser that has been held off for over 100 ms will be much larger than the subsequent pulse. This excess energy can cause unwanted damage to the target of the laser. The circuit does this by scaling the energy sent to the Q-Switch. The result is that this first pulse has the lower energy compared to the subsequent pulses. When the A05 or R05 control option is selected, the circuit is designed to control the output with an analog input signal allowing intensity control of any pulse. This control is used to vary the output energy of the laser pulse. TTL Levels Triggered on TTL Rising Edge. Pulse Width Applied >50 ns. Modulation Operating Mode is "Factory Set" Internally. < 3 watt dissipation in stand by mode. Momentary TTL Low = Driver Reset - after fault is removed. A low power version of the standard R390 series ideal for use with our extensive range of miniature Q-Switches for compact DPSS lasers. Powered from 24VDC, the modulation inputs allow either full digital control or activation of an internal pulse generator. First pulse suppression is implemented through either analogue modulation, RF off analogue control, triggered first pulse suppression, or triggered pre-pulse kill, as described in our FPS guidance notes. 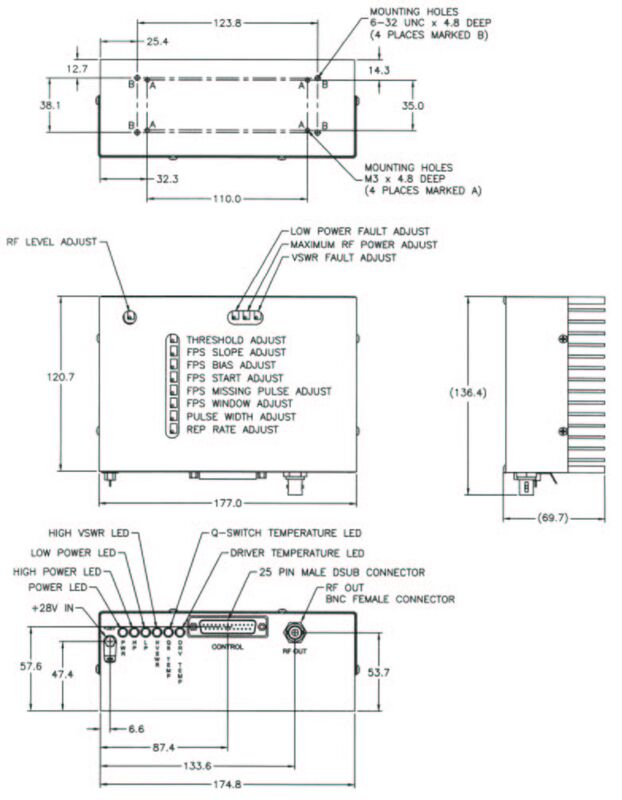 TTL logic outputs monitor driver status and cooling is through forced air over the heat sink.